The River Forth was first bridged by the Forth Bridge in 1890, a monumental piece of railway engineering and an iconic landmark. 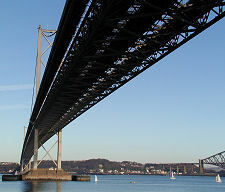 In 1964 the Forth Road Bridge opened to traffic and since then the narrowing of the Forth between Queensferry and North Queensferry has been home to two world class bridges: and more recently to three. 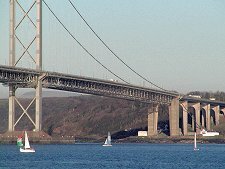 On 30 August 2017, a second Forth Road Bridge, the Queensferry Crossing, opened to traffic, taking a line to the west of the existing bridges. The result is the most impressive concentration of very large bridges anywhere in the world. 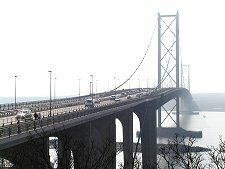 Why a second Forth Road Bridge? The existing road bridge had for many years been carrying volumes of traffic far in excess of what was planned at the time it was built. This led to structural loads much larger than originally forecast, and has also caused one of Scotland's worst bottlenecks, especially for traffic heading south from Fife to Edinburgh on weekday mornings. 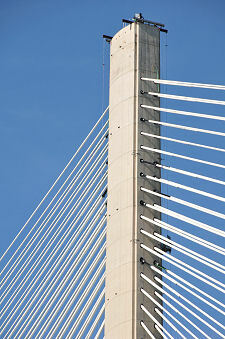 Additionally, corrosion began to appear in the steel strands making up the main suspension cables. The two factors together resulted in fears that use of the bridge by heavy vehicles might have to be restricted. 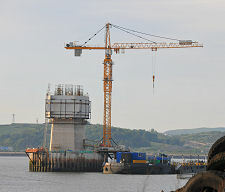 Construction on the new bridge began in 2011, with completion planned to take 5 years. Bad weather (especially high winds that repeatedly stopped work on the bridge) pushed back the completion date from late 2016 until spring 2017, and then until summer 2017. 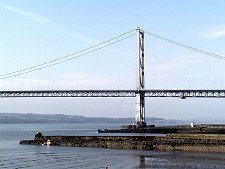 In the meantime a structural issue caused the complete closure of the existing Forth Road Bridge at the end of 2015 and into early 2016, bringing home the importance of the new bridge to Scotland's economy. The scale of the underlying traffic problem is clear from a few headline figures. 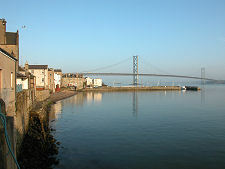 Before the Forth Road Bridge was built, anyone wanting to cross to Fife from Edinburgh took a vehicle ferry from Queensferry to North Queensferry. By the late 1950s, the four ferries on the route were between them making 40,000 crossings each year and carrying 1.5 million people, 600,000 cars and 200,000 goods vehicles. 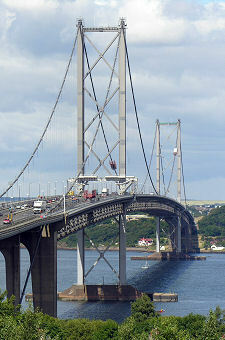 In its first full year of operation, 1965, the Forth Road Bridge carried around two million vehicles in each direction. By 2003 some 12,000,000 vehicles were crossing the bridge each year in total (adding both directions), of which over 700,000 were heavy good vehicles. And in the meantime the maximum permissible weight of a lorry on UK roads had increased from 24 tonnes to 44 tonnes. 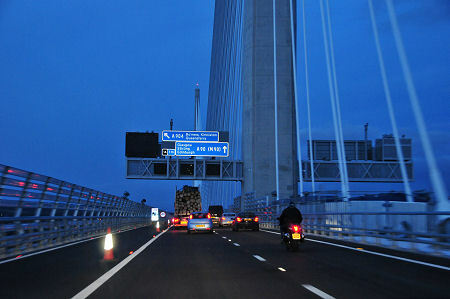 By 2014 the figure had risen to over 12,200,000 vehicles in total crossing the bridge. 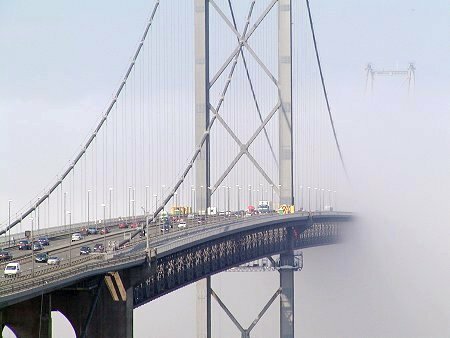 Meanwhile the Scottish Government elected into power in 2007 arrived with a commitment to remove tolls on Scotland's two remaining toll bridges, the Forth Road Bridge and the Tay Bridge. Removing tolls from a bridge whose future was endangered partly by the growth in traffic levels might seem a rather odd thing to do: but the levels of the tolls were so low (£1 for a car, charged northbound only) that their removal probably didn't make that much difference to traffic levels and the overall life expectancy of the bridge. Either way, tolls were removed on 11 February 2008. 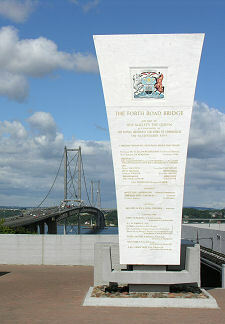 Construction of the first Forth Road Bridge began in 1958. When it was opened in 1964 it was the longest suspension bridge in Europe and the fourth longest in the world. The central span is 3,300ft long, and is flanked by side spans each 1,340ft long. The total length between abutments, counting the viaducts at each end, is 8,259ft. The bridge cost some £19.5m to build, though this figure included the cost of 13km of dual carriageway, 13km of other roads and 24 minor bridges. It used some 39,000 tons of steel (about two thirds the amount used in the Forth (Rail) Bridge), not counting the 30,800 miles of wire, weighing 7,900 tons, in the suspension cables. 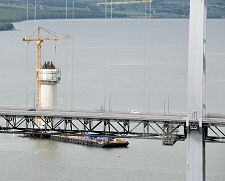 The clearance for shipping below the centre of the bridge is 163ft, and 150ft near the towers. 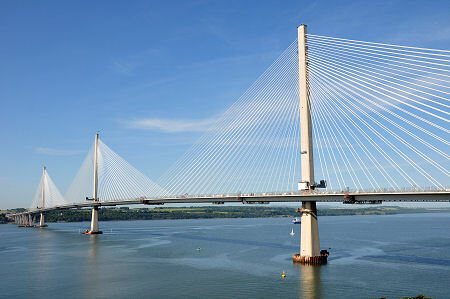 The cable-stayed Queensferry Crossing has two main spans of 650m each and two further spans of 325m each (making it over 100m longer than the older road bridge), supported by three towers. The towers themselves are over 200 metres tall, making them (by 40m) the tallest bridge towers in the UK. 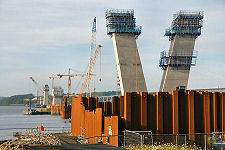 The total cost of construction is said to have been £1.35 billion, rather below the original budget. 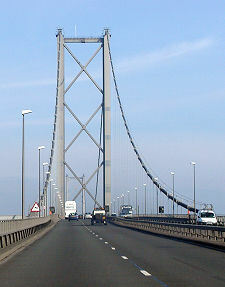 The Forth road bridges are toll free.